Within the American hemisphere, Beijing has extended a lifeline to the corrupt and incompetent Maduro regime in Venezuela, pledging USD 5 billion in questionable loans that can be repaid with oil, Pence told the Washington audience. China is also that country’s single largest creditor, saddling the Venezuelan people with more than USD 50 billion in debt. Beijing is also corrupting some nations’ politics by providing direct support to parties and candidates who promise to accommodate China’s strategic objectives, he said. “Since last year, the Chinese Communist Party has convinced three Latin American nations to sever ties with Taipei and recognise Beijing. 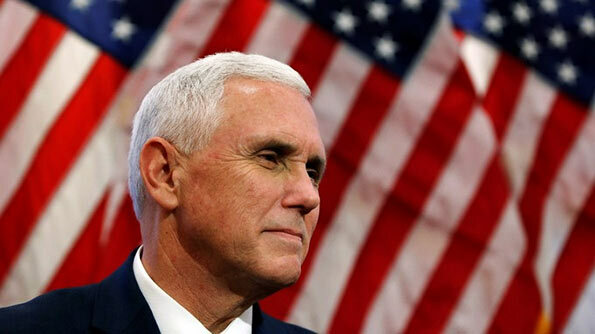 These actions threaten the stability of the Taiwan Strait – and the United States of America condemns these actions,” Pence said. He said while the Trump administration will continue to respect One China Policy, as reflected in the three joint communiques and the Taiwan Relations Act, America will always believe Taiwan’s embrace of democracy shows a better path for all the Chinese people. “These are only a few of the ways that China has sought to advance its strategic interests across the world, with growing intensity and sophistication. Yet previous administrations all but ignored China’s actions – and in many cases, they abetted them. But those days are over,” Pence asserted. Under President Trump’s leadership, the US interests have been defended with renewed American strength, he claimed. “We’ve been making the strongest military in the history of the world stronger still. Earlier this year, the President signed into law the largest increase in our national defense since the days of Ronald Reagan – USD 716 billion to extend our military dominance in every domain,” he said. “We’re modernising our nuclear arsenal, we’re fielding and developing new cutting-edge fighters and bombers, we’re building a new generation of aircraft carriers and warships, and we’re investing as never before in our Armed Forces. “This includes initiating the process to establish the United States Space Force to ensure our continued dominance in space, and authorising increased capability in the cyber world to build deterrence against our adversaries,” he added. China now spends as much on its military as the rest of Asia combined, and Beijing has prioritised capabilities to erode America’s military advantages – on land, at sea, in the air, and in space, Pence alleged. “China wants nothing less than to push the United States of America from the Western Pacific and attempt to prevent us from coming to the aid of our allies,” he alleged. This is exactly what we were telling. Hambathota will be a target for rival military powers. They will fight there. Sri Lanka will suffer. Now the government should build more hospitals and strengthen the health infrastructure in and around Hambanthota. Or think of evacuating people around Hambanthota to safer places. May be in Vilpatuwa. Mr Pence appears to be delusionary re Chinese influence in Sri Lanka. He says “Beijing is also corrupting some nations’ politics by providing direct support to parties and candidates who promise to accommodate China’s strategic objectives” – that’s very very funny !! That’s EXACTLY how Sri Lankans perceive as what US of A does all the time, all over the world !!! Mr Pence, a powerful country like US of A NEEDS TO ACT ABSOLUTELY RESPONSIBLY ALL THE TIME, otherwise she will lose all credibility and that is what appears to have happened. Sri Lankan destiny is linked with certain nuclear powers who they can RELY ON and more importantly the Sri Lankan people have realised this now. Sri Lankans and indeed the whole world, NEVER forget the Libyan President’s brutal, degrading and sadistic death and an American woman who laughed and said”We came, We saw, he died”. I am glad that President Trump defeated that American woman. Don’t get so upset. Diago Garcia is already there. Sooner than later whole of Sri Lanka will be military base for China.